Click to check out Facebook's important Q1 stats. Facebook's sales jumped 38% in the first quarter, boosted by its growing mobile ad business. Investors are laser-focused on mobile, which Facebook has said is the key to its future success. Mobile ad sales accounted for 30% of Facebook's total ad revenue in the first quarter of the year -- up sharply from the previous two quarters and from essentially zero just a year ago. Facebook began working ads into its mobile products only several quarters ago, most notably when it released a new Apple (AAPL) iOS app in August. That mobile ad boost has helped increase revenue, but the growth in monthly active users on Facebook's mobile site and apps is slowing. It jumped 54% over the year to 751 million, which is slightly below the fourth quarter's 57% year-over-year jump, and the 61% annual increase in the third quarter. 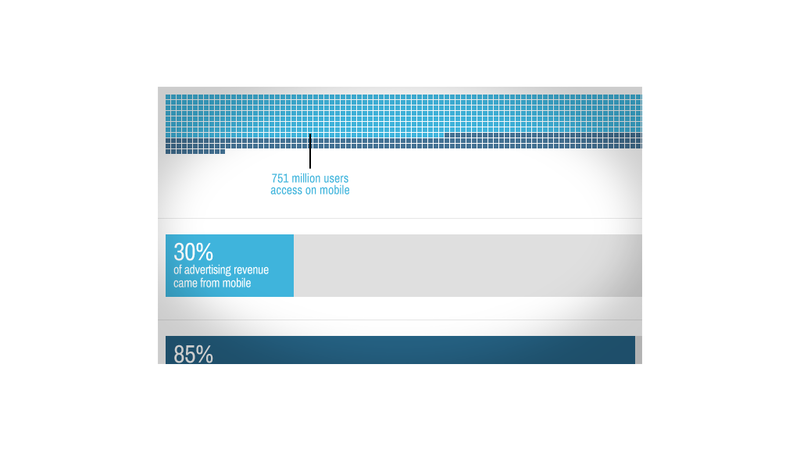 That growth rate will likely continue to shrink as mobile users come into parity with total users. Facebook reported that overall monthly active users jumped to 1.11 billion in the first quarter, 751 million of whom accessed Facebook on their phones and tablets. Facebook (FB) shares were essentially flat in after-hours trading following the report. Facebook founder and CEO Mark Zuckerberg spent a lot of time on the post-earnings conference call talking about advertising, and how the company plans to continue integrating ads without alienating users. "Over the long term, the thing that's going to drive the business is the ads that are very high quality ... things people are interested in," Zuckerberg said. Starting with ads in users news feeds last year "was a valuable step," he added. "Anywhere someone is getting content from Facebook, the business model is following naturally." Facebook plans to continue that philosophy as it rolls out new ad products. COO Sheryl Sandberg said she feels "pretty good" about Facebook's ad formats, but she thinks "there's a lot of room to improve our ads" in terms of quality. Ad sales helped propel the social network's overall revenue to $1.5 billion in the quarter -- a solid performance in what's generally a soft quarter for ad revenue at most companies. Brands typically spend heavily to market to holiday shoppers in the fourth quarter and ease off at the beginning of the year. Earnings rose 7% over the year to $219 million, despite being crunched by massive expenses. Costs jumped 60% over the year to $1.08 billion. Facebook executives had warned during last quarter's earnings call that the company expects expenses to rise by about half this year. Facebook is spending cash on both infrastructure and headcount, and it's putting that money to work: In 2013 so far, the company has already released four major new products. Graph Search and a News Feed revamp came in the first quarter, while the third and fourth products came too late to be included in Wednesday's results. Earlier this month brought Facebook Home, a custom startup screen for Android smartphones that will eventually include ads. A week later, Facebook announced "Partner Categories," which lets advertisers target specific users based on their past buying history -- even if the purchases happened offline. Facebook also revealed that photo-sharing app Instagram reached 100 million monthly active users in the first quarter. Rival social network LinkedIn (LNKD) is set to report its quarterly finances Thursday after the market closes.